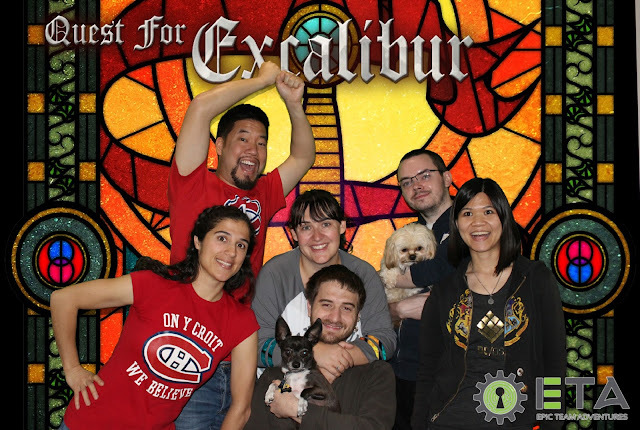 Quest for Excalibur takes you into a room filled with references to Arthurian Lore, (no actual knowledge of this required) particularly the Knights of the Round Table, and the fabled sword itself sits mockingly in the corner, looking conveniently easy to pick up and bop your friends with. Naturally things aren’t that easy and you are immediately warned that you have to enter a code to release the sword, but any wrong entry fails the entire puzzle, so please make this stringently clear if you have younger party members who may be inclined to just frantically try combinations. It is necessary to solve the puzzle of each knight building up to a crescendo which takes place in the center of the room and uses items won from the previous puzzles, a setup which encourages players to first split up and tackle separate puzzles on their own or in small groups, before all coming back together for the triumphant conclusion. It's a successful trope which we’ve enjoyed in other rooms as well. There was plenty for everyone to do even with 6 of us, except perhaps at the end, when I made myself busy being ready to immediately grab the sword as soon as we knew the code (much to the annoyance of my colleagues, who naturally all wanted to pull it themselves). The Raven and The Red Death had a less well known and probably more adult theme of Edgar Allan Poe (again, no actual knowledge of the theme required, but it probably will increase your appreciation), but it was one we all enjoyed as we scurried frantically around a mansion searching for Ravens in order to defeat the "Red Death" culminating in a frightening and dramatic escape. The room itself wasn’t huge and there few/no hidden spaces which is something we generally want to see, but it made excellent use of technology to make the space seem bigger and introduce a unique puzzle dynamic we’ve never seen before. The only downside was that the setup required keeping track of a large number of items which we did a terrible job of organizing initially, until someone devoted a shelving unit purely to that task. As with the other scenario there were plenty of puzzles for us to do throughout with 6 of us branching off into smaller groups to tackle separate puzzles, then everyone being drawn back in for a tense final confrontation which immediately pulled the whole group together. Note that you can "die" if you make too many mistakes at the end so be vigilant! An initial concern of ours was that both of these scenarios actually take part in the same room, which had us worried that both the puzzles and the aesthetic would be too similar from one to the next. A fear which proved unfounded as Epic Team Adventures did an excellent job of completely changing the feel of the room (in a remarkably short time as well) and the puzzles were unique and different across the two. Both rooms carried the vibe of their particular theme well, using some well-placed objects and some excellent use of technology which I won’t spoil here. 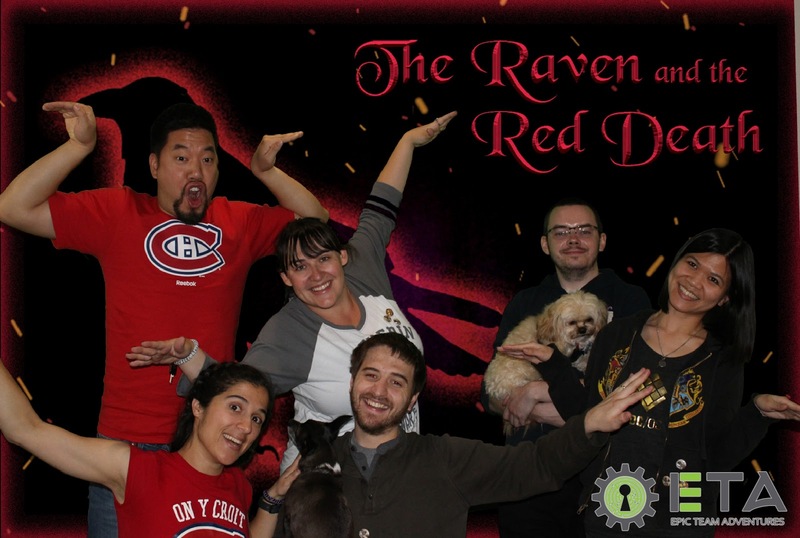 One thing we did notice was that it was apparent that Raven and The Red Death was the latter of the two puzzles designed, as it definitely made more use of the space and technology available in the room, which just goes to show that it was iterated upon well. Lastly, the game designer was available as our Game Master for both of these rooms to help keep us on the right track, and we spoke to him for half an hour afterwards about how the rooms could be improved and what we liked, so it’s nice to know feedback is being taken onboard. We look forward to seeing the mark III whenever we next get a chance to visit Seattle. 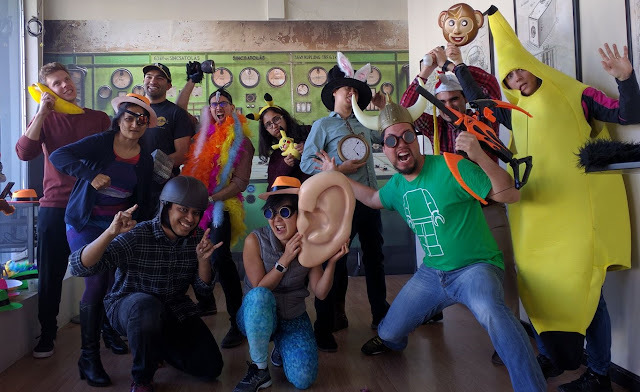 Set/room design: Great decor, vibe and props were awesome, this is a puzzle lovers game in a single room where puzzles are self contained with explicit instructions and require little searching in the room itself.